The DLC is a homeschool collaborative. We support families who want to learn together outside of traditional school environments. We host social events for the broader Santa Cruz County homeschooling community. We are different from learning centers that provide outsourced academic classes. We are 100% volunteer run and non-profit. We only offer classes and social activities based on what our active member families are passionate about teaching, learning, and doing together. Our members enjoy access to our lending library of curricula, educational materials and learning games. Many of our events are drop-in and you can subscribe to our newsletter free of charge. We do our best to keep our volunteer classes and events low cost ($10 each). Supporting members join as a family. The entire family gets free entrance to DLC classes and events for the term of the membership. Fill out our membership form to sign up or renew your membership. Then pay online to complete the process. Our board meetings are always open to anyone who would like to get involved. Do you have an idea about how the DLC could better support local homeschoolers? Come share it with the board! Learn in Community. Share Your Passion. If you feel a calling to learn along side your kids this school year, we invite you to organize a class at the DLC. We are accepting proposals for fall classes, activities, clubs, and events now. You don't have to be a professional teacher, just someone who is passionate about a particular topic and willing to share your curiosity and expertise with the next generation. You can lead a one day, one week, or all semester long activity this fall. Talk to your family. What do you want to explore together? What do you care about learning? What matters? Submit your class, event, activity, or workshop proposal today! We could use help with our tween and teen social events. Families interested in helping with set-up and clean-up, taking tickets, serving food, decorating, or planning can email Stephie Tucker at stephie@apis-media.com. If you have family or friends who use Amazon, please share this link with them. Check out our spring semester classes and register online through our digital CourseStorm catalog! All classes and events are FREE to supporting members. Supporting members join as a family. The entire family gets free entrance to all DLC classes and events for the term of the membership. All classes and events are open to the homeschooling community. You may pay for classes and events individually without becoming a member. NOTE: The DLC is not a drop off program. If you wish to leave the DLC campus while your child is participating in a class, activity, or club, then you must arrange for another parent or caregiver who will be staying on campus to supervise your child. Study history and pre-history through tech advances! We will start in the paleolithic 20,000 years ago, discussing what technologies "cave men" had at their disposal. Then we'll move forward in time towards agriculture, writing and beyond. Wherever possible, we will engage in hands on crafts and games (maybe even foods) relevant to each advance. Contact melody@panttaja.com if interested in joining. Amanda Abronson is a homeschool teacher with an interest in Spanish. Her undergraduate degree was in Linguistics and she has studied a number of language teaching methods, including in the UC TESOL/TEFL certificate program. Community event including dance, music, tea parties, crafts, building and active games. Activity will change weekly, so please check our facebook group for each week's event. Using Ellen McHenry's "Mapping The World With Art" (not the similarly named David Smith's "Mapping the World By Heart! "), we will explore geography, history, cartography, and exploration. Students will learn the geography of our world using activities and by drawing regional maps. The final project will be to complete a map of the world. The focus is more on physical geography rather than political boundaries. This is ideal for kinetic and activity based learners. 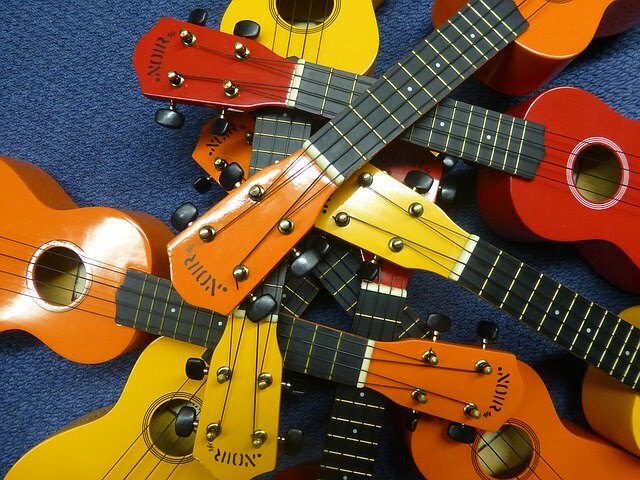 This class is a fun and easy introduction to ukulele for students with no prior experience. This class is for children ages 5-10 and will progress at a gentle pace. Caregivers are welcome to sign up also. Students are responsible for bringing their own ukuleles to the first day of class. This class is a fun and easy introduction to ukulele for students with no prior experience, but will progress more quickly than the elementary age class. Ages 10 and up.